Last week when I posted the pictures of my new room someone had asked that I put up how to make these earring hangers that I made. They are super easy and quick to make. Let’s get started. 1. Picture frames (I found these at HomeGoods, they were between $7 and $12). 2. Lace eyelet ribbon (available at any craft store from between $3 and $10). 3. Hot Glue gun & glue sticks (I already had these, but you can find them at any craft store; the gun itself can go from $2 to $20 depending on how nice you want it. 4. Picture hangers (any hardware or craft store….. or even WalMart or Target, anywhere really). Step One: Measure out the ribbon on the back of the frames. Hot Glue the end of the ribbon on each side of the frame. For the top layer of ribbon that will rest along the top of the frame, I hot glued the whole ribbon so I could hang heavier earrings from there without fearing that they’ll pull the ribbon down. Step two: This is the fun (or frustrating) part. After the glue dries (make sure it dries all the way so the earrings don’t pull on the ribbon) start hanging your earrings! Now the wonderful thing about these earring hangers is that they really allow for some amazing organizing. My jewelry box was the biggest disaster ever. Like I said before, I was housing half of my collection mini zip lock bags and kept all those in one big bag that I brought back and forth when I would go home for weekends or something. Now that I am all settled in one place (home!!) I can finally lay everything out and stop carrying my ish around in plastic bags. I wish I took some before pictures of my absurdly messy jewelry box so you guys could reaaaalllly get a feel for how well these earring hangers actually worked for me.Unfortunately, I did not, but you can kind of get the gist of it. 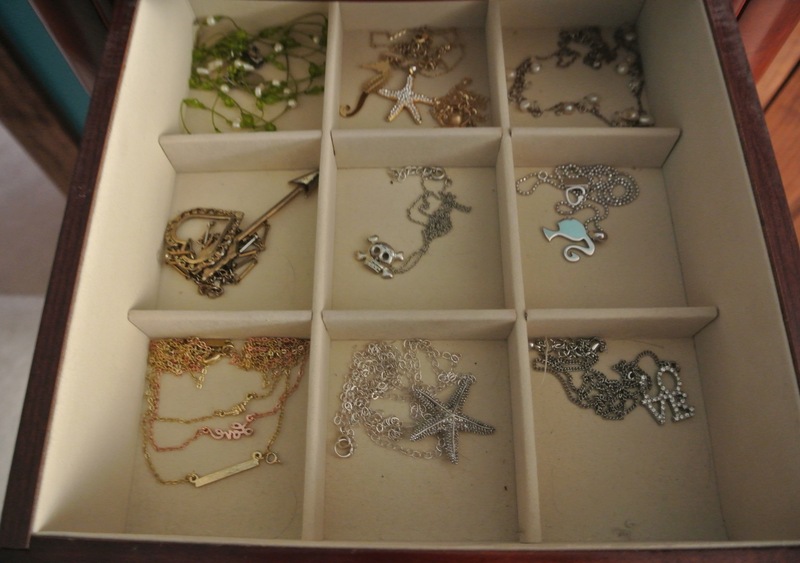 Check out how clean and organized my jewelry box is now! All three of these drawers were previously dedicated to earrings which meant all of my other jewelry was tangled together in the rest of the box. Now I have a ton of room open for my delicate necklaces to be by themselves, my watches, my bracelets. Everything has a place now and it makes accessorizing THAT much easier. So this whole project took me like 15 minutes and it’s really easy and honestly just very beneficial for me! You should definitely make one of these and it will make your life so much easier. Do it up and let me know how it goes! Hope this tutorial was helpful for you guys! Thank you for this!! It’s awesome. I can’t wait to try it this weekend. 🙂 So easy too. Hope you do a manicure tutorial soon! Previous PostPrevious Inside my new digs.